청곡사 업경전은 다른 사찰의 명부전과 같이 지장보살을 비롯해 시왕 등 명부의 존상들이 봉안된 전각이다. 업경전에는 불단에 지장보살좌상을 중심으로 도명존자와 무독귀왕인 지장보살삼존상이 자리하고 좌우로 시왕, 귀왕, 판관, 인왕 등 총 21구가 배치되어 있다. 지장보살좌상에서 발견된 발원문에 의하면, 이 상들은 1657년에 조성되었다. 지장보살삼존상을 포함해 시왕상 및 권속을 살펴보면, 일반적으로 좌상의 지장보살은 입상이나 의자상인 다른 권속보다 크게 조성해 위용 있게 표현하지만, 청곡사 지장보살좌상은 도명존자와 무독귀왕, 시왕 등과 비슷한 크기로 주존을 제작하였다. 모든 존상의 상호는 둥근 얼굴형에 두 눈은 눈꼬리가 길게 빠졌으며, 코는 높고 콧등이 반듯하고 입술은 작아 아이 같은 인상을 준다. 각 존상의 비례를 보면, 전체적으로 신체에 비해 두부를 크게 제작하였다. 특히 무독귀왕, 시왕 및 권속 등은 쓰고 있는 관모가 높아 3등신의 신체비례를 하고 있다. 신체는 어깨가 둥글고 좁지만 상체와 하체를 양감 있게 처리하였다. 지장보살좌상은 무릎이 높고 폭이 넓어 앉은 자세가 안정감이 있으며, 의자상의 시왕과 범천·제석천상 등도 의자에 허리를 기대고 무릎을 내려뜨린 자세가 다양하고 자연스럽다. 지장보살좌상은 이중으로 대의를 걸쳤으며, 드러낸 가슴 아래에는 승각기가 가로지르고 있다. 옷주름은 상체의 대의자락은 간략하게 직선으로 양감 있게 처리한 반면 하체의 옷주름은 곡선을 살려 장식적면서 볼륨감을 살려 두텁게 표현하였다. 장식적인 곡선의 옷주름 표현은 도명존자의 가사나 시왕의 무릎의 옷주름 등에서도 찾을 수 있다. 어린아이와 같은 상호와 신체비례와 달리 두 손은 여성스럽게 가늘고 길게 조각하였다. 이 상을 조성한 조각승은 인영(印迎), 탄준(誕隼), 지변(智邊), 학염(學廉), 서명(瑞明), 법율(法律), 종탄(宗誕), 선우(善祐) 등으로 청곡사 업경전의 상들을 제외하고는 현재 이들이 조성한 다른 불상은 알려지지 않았다. 청곡사 불상은 비록 17세기에 활동한 여러 조각승의 불상과 계통이 연결되는 요소가 없는 독특한 조각 형식을 하고 있으며, 상의 전체적인 조형미가 뛰어나고 조각 수법 또한 우수하다. 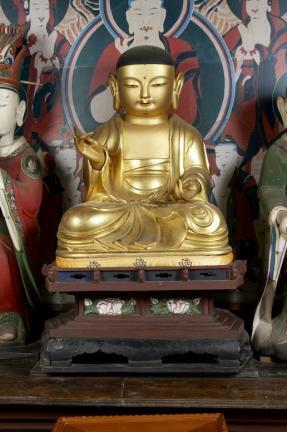 In Cheonggoksa Temple, statues of Buddhist deities related to judgment and hell, such as Ksitigarbha Bodhisattva and the Ten Underworld Kings, that are normalized found in other temples, in Myeongbujeon Hall, are housed in Eopgyeongjeon Hall. 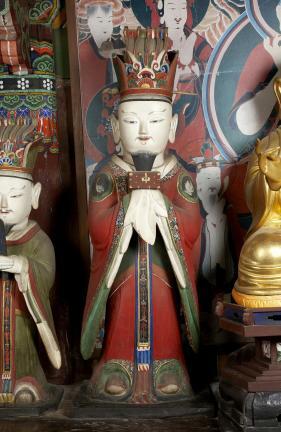 Twenty-three total statues are on display in Eopgyeongjeon Hall. Ksitigarbha is flanked by Domyeongjonja (Daoming) and Mudokgwiwang (Innoxious King of Ghosts), forming a triad of a sort. On the left and right sides of the triad stand other figures including the Ten Underworld Kings, Kings of Ghosts, judges, Brahma, and Indra. According to the prayer scroll found inside the seated statue of Ksitigarbha Bodhisattva, these statues were made in 1657. As a general rule, in this type of judgment-related statue groups, the statue of Ksitigarbha Bodhisattva tends to be much larger in size, as well as look more majestic, than two other members of the triad and others making up his retinue. Even though a seated statue, Ksitigarbha Bodhisattva is often taller than others portrayed standing. But, in the case of the Seated Ksitigarbha Bodhisattva of Cheonggoksa Temple, its size is not measurably larger than that of Domyeongjonja or Mudokgwiwang, or the Ten Underworld Kings. 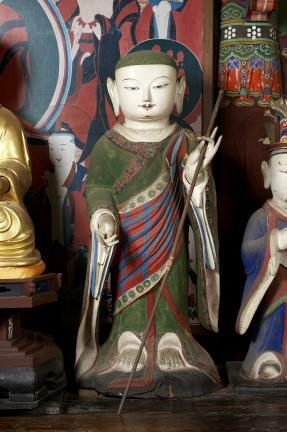 All statues in Eopgyeongjeon Hall have a round face with long, almond-shaped eyes. Their noses are a high and well-defined bridge. Their small mouth, meanwhile, gives them a childlike air. The statues have a quite large head, compared to the size of their body. The heads of Mudokgwiwang, the Ten Underworld Kings and their retinues appear particularly huge, as they are surmounted by tall headgears, so that the height of the head combined with the headgear represents nearly one-third of their total height. Their body seems voluminous, although the rounded shoulders are quite narrow. The seated statue of Ksitigarbha Bodhisattva has wide knees, placed in a comparatively elevated position vis-à-vis the throne and appears, for this reason, stable and balanced. The Ten Underworld Kings, Brahma, and Indra, represented seated on a chair, have their torso leaned against the back of the chair, in various positions that are all very natural. The Seated Ksitigarbha Bodhisattva’s robe lets the top garment, worn inside, appear at the chest level, and the top edge of the garment forms a straight horizontal line running across the chest. The drapery folds, in the upper body, are rendered by a few simple, straight lines in pronounced relief, and the folds in the lower body are in curved lines that are decorative yet thick enough to effectively translate volume and depth. Similarly decorative curves are also used to render the folds in the outer vestment of Domyeongjonja and the folds over the lap of the Ten Underworld Kings. In contrast to the facial features and the bodily proportions that give these statues a childlike air, their hands are highly delicate and almost feminine with long and slim fingers. The twenty-three statues were carved by a group of monk sculptors, including Inyeong, Tanjun, Jibyeon, Hakyeom, Seomyeong, Beopyul, Jongtan, and Seonu. No other works by these sculptors, meanwhile, are known outside the statues of Eopgyeongjeon Hall in Cheonggoksa Temple. These twenty-three statues, completely devoid of elements pointing to the influence of, or affinity with, other 17th-century Buddhist sculptures or sculptors, are highly original and singular in their style. They are furthermore great pieces of sculptural work that are aesthetically impressive. Some of these statues have been already designated as cultural heritage objects. The Wooden Seated Indra and Brahma of Cheonggoksa Temple (Treasure No. 1232) are the only surviving Joseon sculptures representing these Buddhist deities, as well as two excellent pieces of sculptural art.